Plumber To The Rescue was thanked recently by Barnardos Children’s Charity. 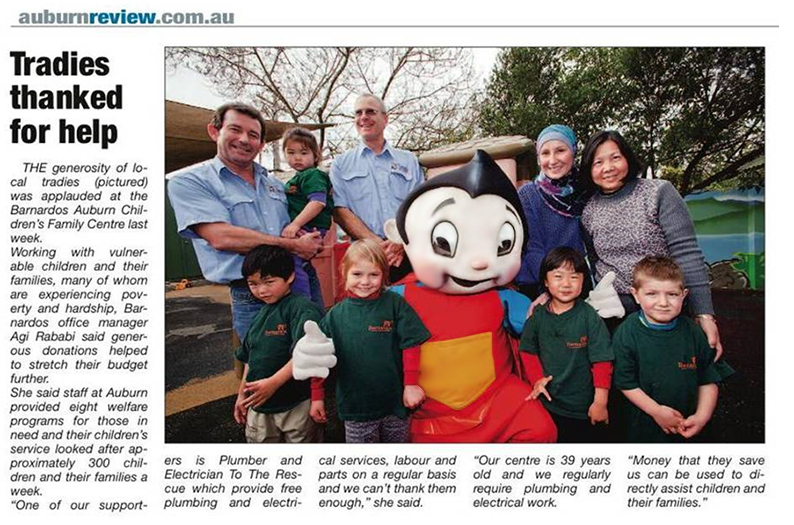 For well over 10 years we have been providing free plumbing & electrical work to the Auburn Children’s Family Centre. Over the years of working with the staff at the Barnardos, we have seen how the staff at the the Auburn Children's Family centre are the most caring people around. The work they do helping children and their families who are suffering is heart warming. They deserve all the help we can give them and their partners. The photo above was taken courtesy of the Auburn Review. Take a look below to read the original story published in the Auburn review.